Just a few days ago, Russia-backed militants initiated an unprovoked attack upon Ukrainian civilian population and Ukrainian troops at the frontline in eastern Ukraine. This time, following long months of trench warfare, Russian proxies attempted to take over the town of Avdiyivka which is controlled by Ukrainian Armed Forces, but met heavy resistance of Ukraine`s sovereignty defenders. Hostilities in this area continue to bring suffering to the innocent residents of Avdiyivka causing severe infrastructural damage and claiming people’s lives on both sides. Ukraine Crisis Media Center offers the infographic that depicts the military situation in this major “hotspot”. 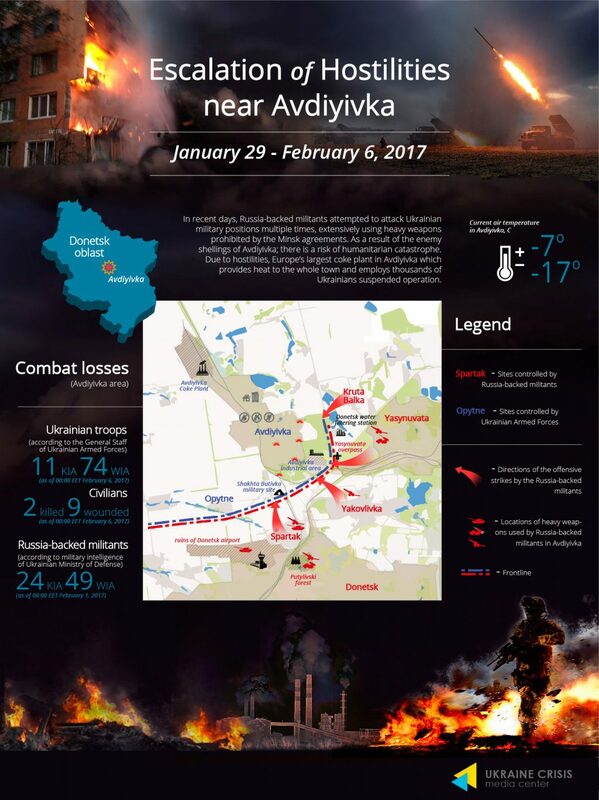 It is based on the most recent data including casualties, infrastructural damage and vectors of enemy offensives in Avdiyivka area.